Project: Wedding Invitations, Sunflower Seed Instruction Tags and Thank You Postcards. Brief: The client came to me with a wonderful concept, she wanted to give each of her wedding guests a small Maori flax Kite bag containing sunflower seeds. So they could plant the seeds and grow a sunflower in memory of the wedding. Maroon was requested as the wedding colours theme. 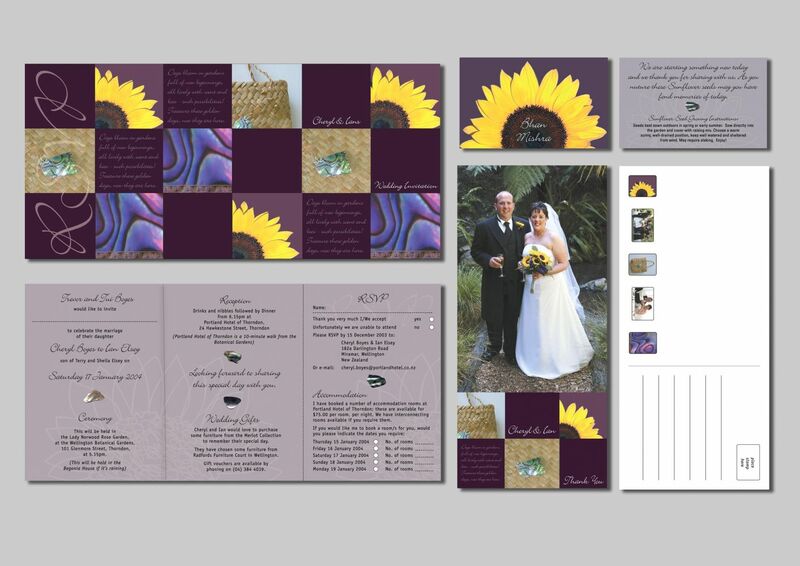 Solution: The invitation design used photos of the Maori flax Kite basket, Sunflowers and Paua shell in swatch boxes. The wedding themes colour, maroon was added as a box incorporating a poem in beautiful typography. “Thank you, Sharon, for doing such a wonderful job. We both loved your photo of the Kite how and you beautifully incorporated it with the Paua and Sunflowers”.